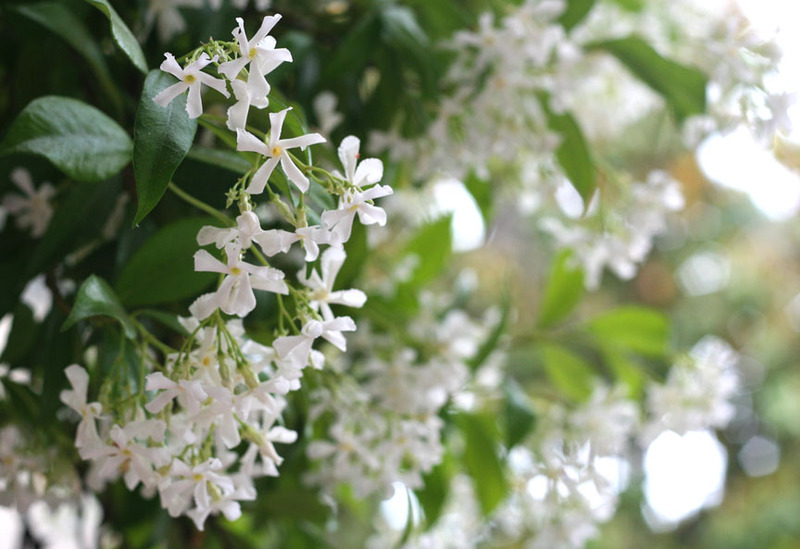 I think my favorite thing about our apartment is the jasmine hanging outside our front door. It’s in full bloom right now…every time I leave the house I see it, smell it, and smile. I can’t share the amazing smell with you, but I can share their beauty! I know last week was a holiday, so I’ll cut you a little slack…but it’s back to normal life, people! Post your menus! We all love seeing them! If you haven’t posted before, go for it! Who doesn’t love a polka dot? And what better place to put a polka dot than on a cake?! Seriously, how cute is this? My friend Natalee has been making these cute polka dot cakes lately and I asked her to please share her secret so that I might pass it on to you! She kindly obliged, so here’s the lowdown on how to polka your cake to the nines. To give credit where credit is due…our good friened Melissa from ISLY turned Natalee on to this post from inchmark, which is where the original idea came from. Natalee has provided additional information below, including the recipe for the icing. Thanks to all of your beautiful minds for providing such a wonderful idea! Directions to mix icing: In a bowl, sift together confectioners’ sugar and cream of tartar. Using electric mixer, beat in 2 beaten egg whites for about 5 minutes or until mixture is thick enough to hold its shape. I ended up having to water the icing down a little bit, but I think you just have to play with it until it seems right. It needs to be thin enough that it will pipe into the circle shapes without any peaks, but thick enough that it won’t run outside of the parameters of the circle. Better to err on the side of too thick. 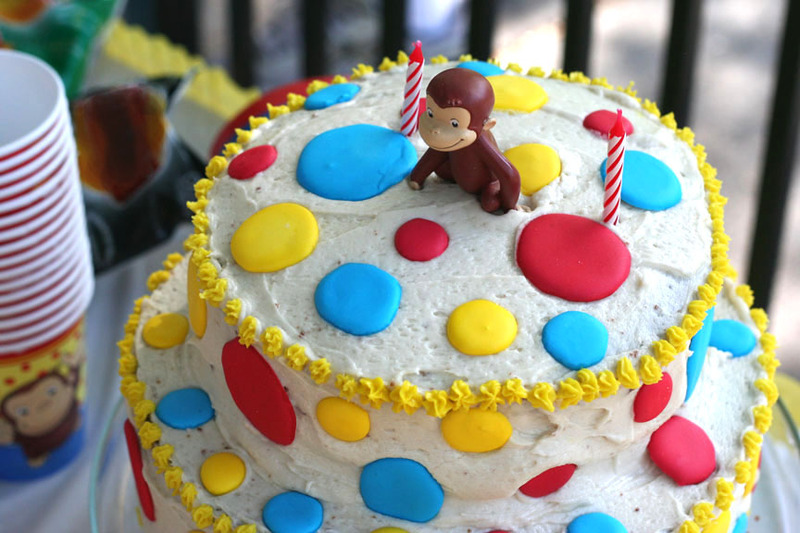 As far as the food coloring, I’ve found that if you really want GOOD colors, you have to get the cake decorator’s gel paste food coloring which you can find at either Michael’s or Diddams (and I’m sure any party/cake decor store) and online. All you have to use is a little glob on the end of a toothpick to get the same color you get from an entire bottle/tube of the stuff you buy in the store. Plus, I’ve found that if you add the whole bottle from the store, your icing tastes like chemicals. After the icing is colored, you just need to put it in an icing bag with a large round tip (or if you don’t have one you can do what I did and cut a corner off of a ziploc). Then Rob (her hubby) made a template (click here to download) of different sizes of circles, printed it out on paper and put the template under some waxed paper. Then I piped right on to the wax paper in the shape/sizes of the circles. Once they are all piped on, you just let them harden at least 12 hours and then they will come right off and you can put them right on your frosted cake. I recommend going directly from waxed paper to cake as stacking them for storage causes colors to bleed if there is absolutely any humidity in the air/fridge. 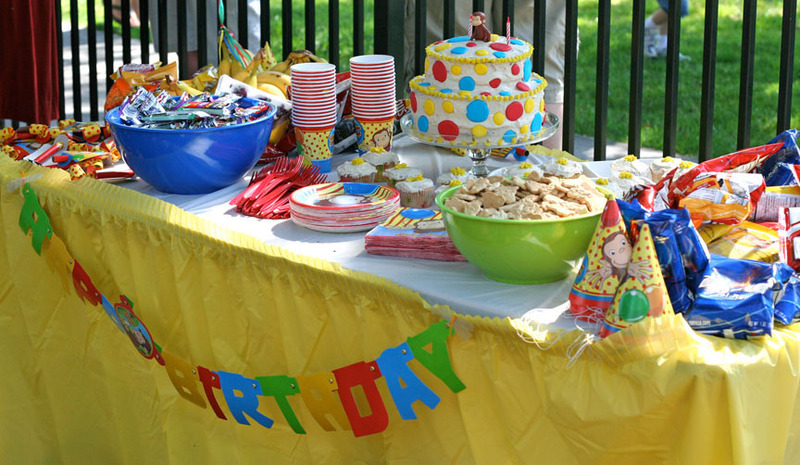 It really is such a cute idea…and look how festive the cake looks on the birthday table! Happy Polka Dotting! SocialLuxe Lounge and the BlogLuxe Awards! You may have noticed that cute little flashing button for SocialLuxe Lounge on my sidebar. And you may be wondering what it is. WELL…it’s getting so exciting I just have to talk about it! I am co-hosting the Swiffer SocialLuxe Lounge in Chicago on July 23! It’s a pre-BlogHer pamper & primp party in the Hyatt Regency Chicago’s penthouse suite. And it’s going to be fantastic. I’m co-hosting with 5 other fantastic women bloggers, and we have some great sponsors…Swiffer, Kodak, Lands’ End and OPI…just to name a few! The closer we get to the party, the more giddy I get. It really is going to be so fun…and it’s been empowering to work with such a talented group of women to pull it all together. Even if you’re not going to BlogHer, you can still participate! It’s time to nominate your favorite women bloggers for the prestigious 2009 BlogLuxe Awards. Simply click here and nominate your favorites…and VOTE VOTE VOTE! You may see a familiar face under Tastiest. 😉 Go Vote! It’s easy! Click here for more information on each category. I love Jif peanut butter. It’s the only kind I’ll eat. YUM YUM YUM. I’ve tried other brands as well as natural peanut butters and have never been happy. I even tried making my own…let’s just say I’ll be leaving that task to the experts. 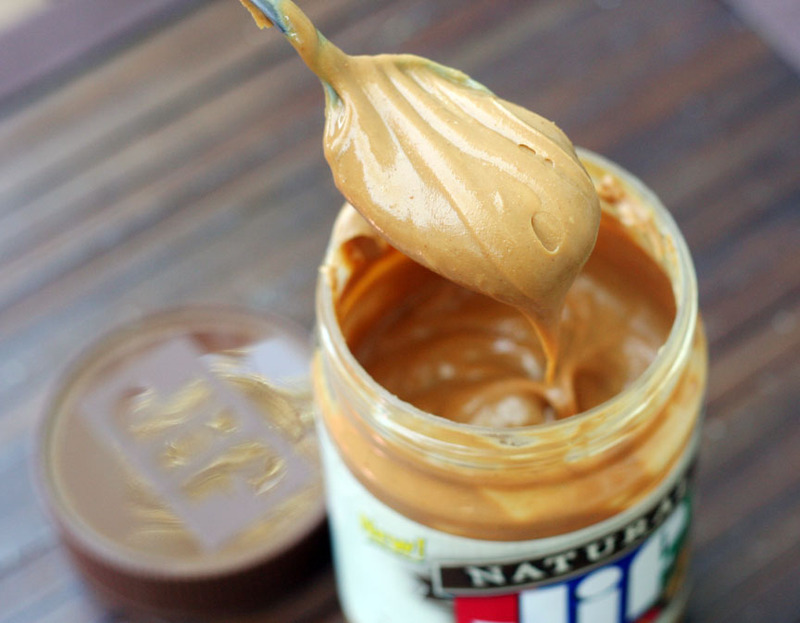 My friends and I were discussing this recently and Natalee piped in with, “Jif has a new natural peanut butter – and it’s great! Super smooth, great flavor, I love it!” We were all sold and decided to try it. Fast forward to the next day, hanging out with the same friends, me (obnoxiously) checking my email on my iPhone. Want to guess what was sitting in my Inbox? A press release from Jif announcing their new Jif Natural Peanut Butter! We decided Jif should have paid Natalee a few bucks and let her write the press release…and seriously, why was she so on top of this new product release? We all felt a little bit like a living commercial. Pretty funny. Serendipity dictated that I must respond to the email…Jif gladly sent along some Jif Natural for me to try. I must confess, regular creamy Jif will always be my favorite, but Jif Natural is very good. It has a stronger roasted peanut flavor and a nice smooth texture. Natalee was right, it beats out other natural peanut butters for sure. Happy Memorial Day Weekend! 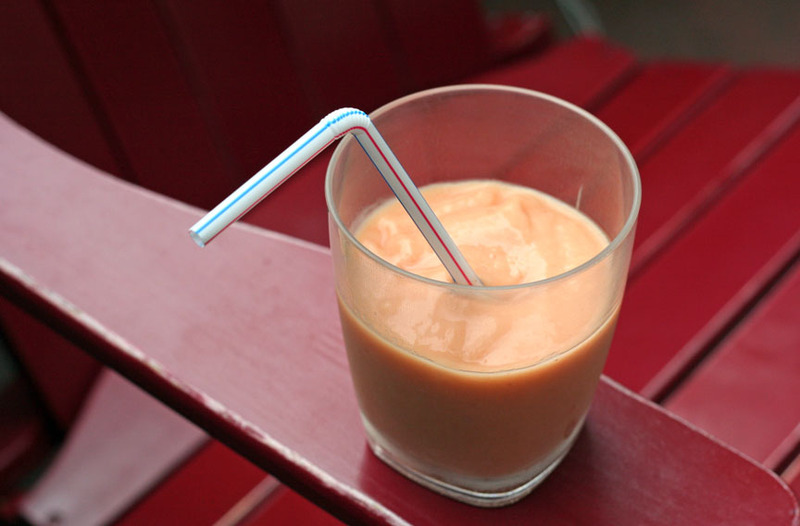 Sorry I haven’t shared any fantastic food ideas with you…I’ve been too busy enjoying the weekend and drinking yummy smoothies prepared by Nate. 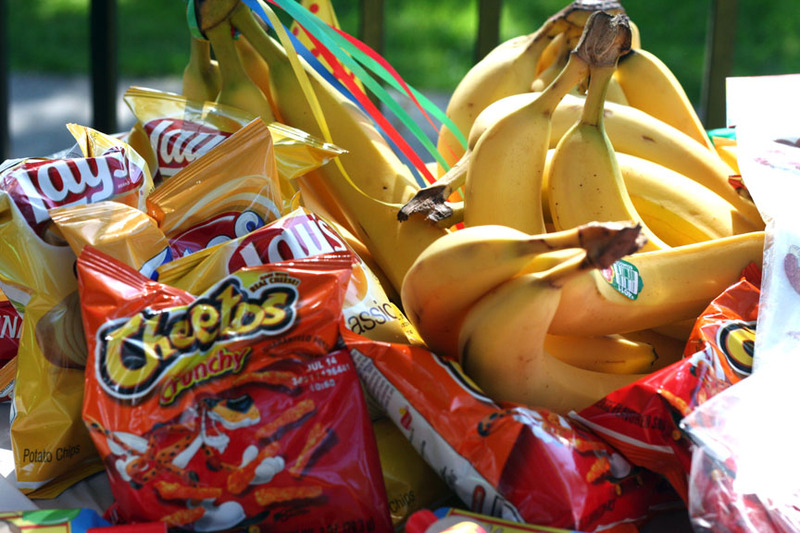 If you are looking for Memorial Day ideas, check out this post from last year with some great picnic ideas…and if you have picnic ideas to share, please go leave a comment on the picnic post! – Ricotta Pasta with Tomatoes al Forno (Rachael Ray 365: No Repeats) – thanks Courtney, I have that cookbook, and this sounds delish – gonna give it a try! Please share your menus! Happy long weekend! My favorite sandwich the Rachel also sports this salad topping. I guess I just like sandwiches with coleslaw…which is funny considering I would never eat coleslaw alone. Yuck. But I will grant that it makes for one tasty, fresh, crunchy addition to a sandwich. Yum. 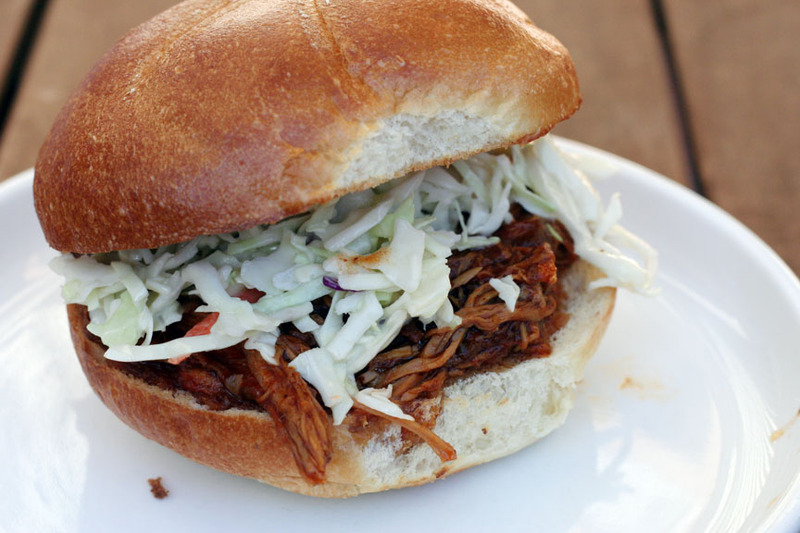 PS…If you were planning on using the Texas Pulled Pork recipe on the Recipes-Main Dishes page…I just added my modified version of this recipe underneath it (you’ll have to scroll down near the bottom). My version is sweeter, which Nate and I both liked better. But I think it is a matter of taste…if you like a smokier, not-so-sweet flavor, the original recipe is for you. No, there isn’t. Seriously, Isn’t watermelon supposed to be red? Light pink just isn’t right. I haven’t bought a GOOD watermelon in years. I’m not exaggerating. Am I just a bad watermelon selector? 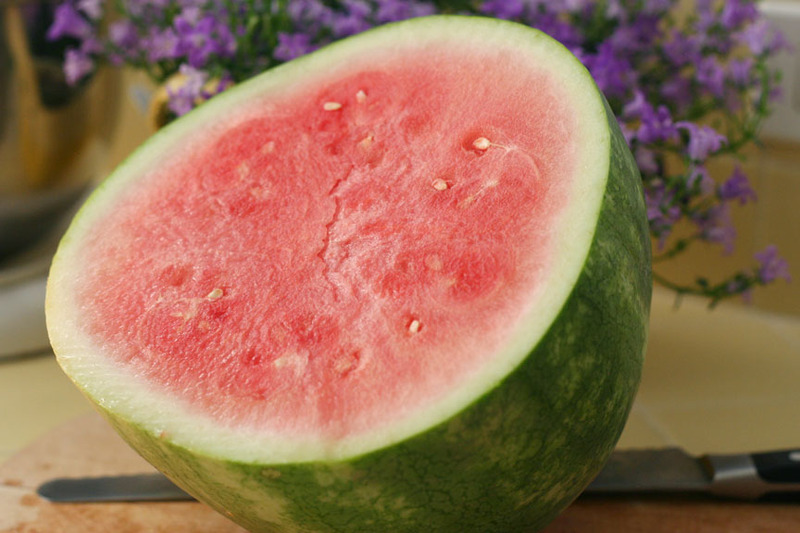 Or are watermelons simply the victim of mass-produced produce? Alton Brown once said on Good Eats that you should pick watermelons with a bigger yellow spot on the bottom. The yellow spot supposedly indicates that the watermelon was in the field longer before being picked, therefore more ripe. No luck folks, the trick does NOT work. Which was disappointing to discover, normally Alton is right on. And I really wanted him to be right this time. Is finding a good watermelon just a crap shoot? Does anyone feel as sad about this situation as I do..or am I just nuts? Wait, don’t answer that. Time for your menus…bring it on! 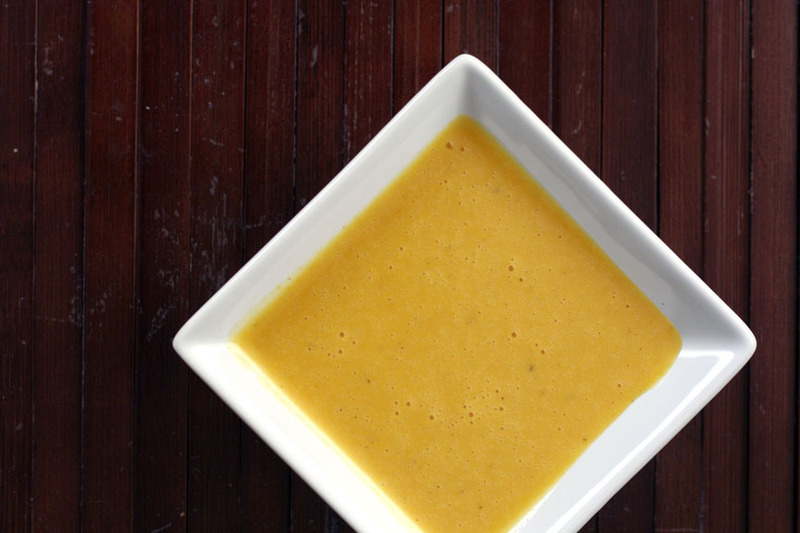 I know you’re eating…so tell us what it is! Update: Okay, so the technique below worked great and this steak was delicious. BUT…I have since discovered another technique that is foolproof and the only way I will cook steak from here on out. So, feel free to keep reading this post, but I also would suggest checking out this more recent post by clicking here. This beautiful New York strip steak was one of my Mother’s Day presents. (Sorry to the vegetarians out there…I always feel a little bad slapping a big piece of meat across your screen…but it was too good not to share!) Nate cooked it to delicious perfection, so we thought we’d share what he did. 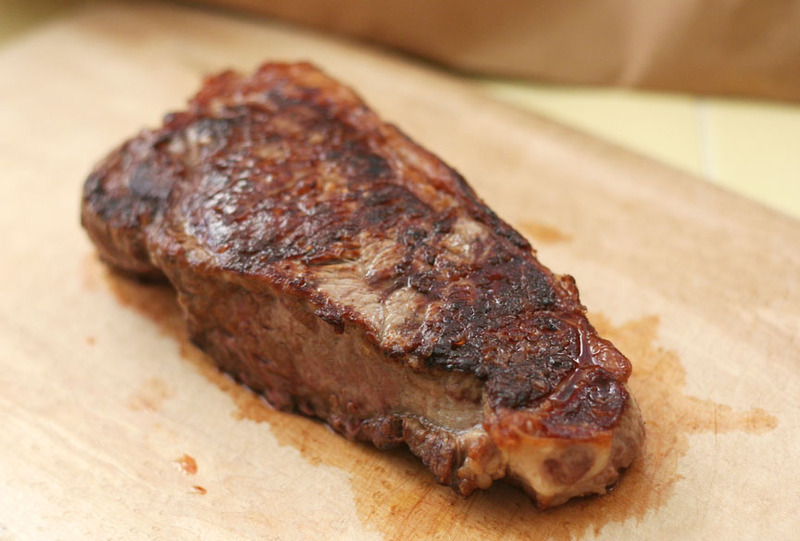 – Let steak sit at room temperature for an hour before cooking. Medium rare is the only way to eat a steak. If you don’t like it that way, then you’ll have to experiment yourself with the oven cooking time. I refuse to assist with your endeavor, however! 🙂 You can probably find a chart online that tells you what temperature the steak should be for what doneness you want. I wish it was Mother’s Day again. All this steak talk is making me hungry.